Just like us humans, cats need to get rest to feel their best. Without rest, your furry friend simply won’t be as healthy as they could be. While you may think your cat sleeps deeply all day, that’s not always true. Hence, one of the best cat beds could be ideal for your furry friend. Finding the perfect bed for your furry friend is vital. With proper training, your cat will spend just as much time in bed as us humans do. As such, you need to buy a cat bed that’s relaxing and incredibly comfortable. A cat bed provides your furry friend with a place to call their own. They know they can retreat to the bed whenever they feel like it without being bothered. It will become like their home. For cat owners looking for a multi-faceted cat bed, the Midwest Homes Feline Nuvo Curious Cat Cube fits the bill. The model allows cats to sleep in the den feature or on the top roof. There’s also attached toys and curious cutouts that cats enjoy playing with. Coming in an attractive brown color, the bed is attractive and blends well with many a home décor. It’s easy to assemble, and many of our furry friends were quite fond of the unique design. If your furry friend loves to lay in a sunny spot or look out the window, then the Sunny Seat may be right up your alley. This cat bed allows your furry friend to lay right next to the window and bask in the sun. Using industrial strength suction cups, this model can hold up to 50 pounds of pure cat. That’s one big kitty! A removable and washable cover adds the convenience of easy cleaning. As cats love a high vantage point, the sun, and windows – this model is exceptionally popular among cat owners. 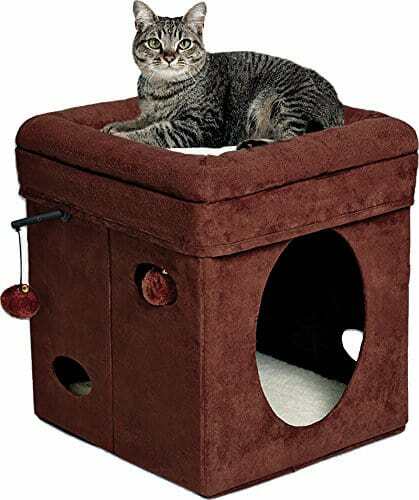 In fact, the Sunny Seat Window-Mounted Bed is the #1 best-selling cat bed for large cats on Amazon. We highly recommend this model after testing. 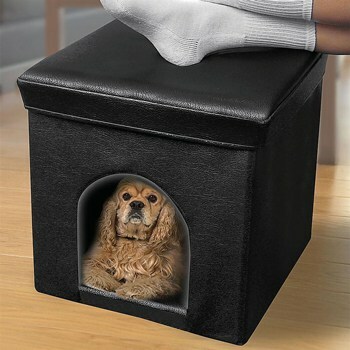 If you’re looking for a cat bed that offers more than a place for your furry friend to sleep, the Pet Ottoman is for you. Doubling as a cat bed and a padded footrest for humans, this unique model blends well with many a living room. The black finish is stunning and looks nice in most homes. The durable PVC construction ensures this bed will last a long time. Plus, your cat will love it, as the design is spacious and comfortable for our furry friends. Size: You must take your cat’s size and age into account when looking for beds. Getting a bed that fits your kitten won’t last long, as he’ll outgrow it quickly. You want a bed that allows your cat to move around a bit and find the right spot. A bed that’s 3-5 times larger than your cat should do the trick. Where It Goes? : Finding the perfect placement for your piece is also important. This could affect the size of the bed and the style you choose, too. Find a color that meshes well with the décor of your home. Comfort: If your cat doesn’t find the bed comfortable, he’ll never sleep in it. As such, you need to make sure you find one that is comfortable, safe, and secure for your furry friend. You need your cat to love it if he’s going to sleep in it all the time. It needs to be more comfortable than the couch. Features: For older cats with arthritis issues, you’ll want a bed made of thick padding or memory foam. Heat beds can be useful for kitties living in cold areas. Cats always seek warmth, especially if they have arthritis. Cleaning: Many cat beds come with machine washable covers. These can be a handy feature, as it’ll be easier to clean the bed from time to time. You’ll have to clean it once in awhile, or your cat may stop using it once it gets too dirty. You’ll want to experiment with where you put the cat bed a little bit. Your cat will love a clean, relaxing, and quiet place to sleep. Temperature also plays a huge role. The location can’t be too hot or too cold. You’ll want to test out locations. Find out where your cat likes to sleep best. Then leave it there. If you don’t like the look of where your cat prefers to sleep, then a little negotiation with treats can go along the way while training them to use it properly. If you invest in one of the best cat beds, it’s imperative that your furry friend sleeps in the bed. You don’t want to waste money. Sure, some people love it when their cats snuggle with them, others don’t. That’s why you bought a bed for your furry friend. Now, you just need to make sure your furball uses it. Start by placing the bed in the spot your cat prefers to sleep now. This could be on top of the couch or near the heater. Then put some catnip and treats in the bed. Maybe the cat’s favorite toy, too. This will entice your furry friend to get into the bed. Cat bed training is essential if you want your cat to sleep in it. Cats don’t like change, so treats are an important part of the process. 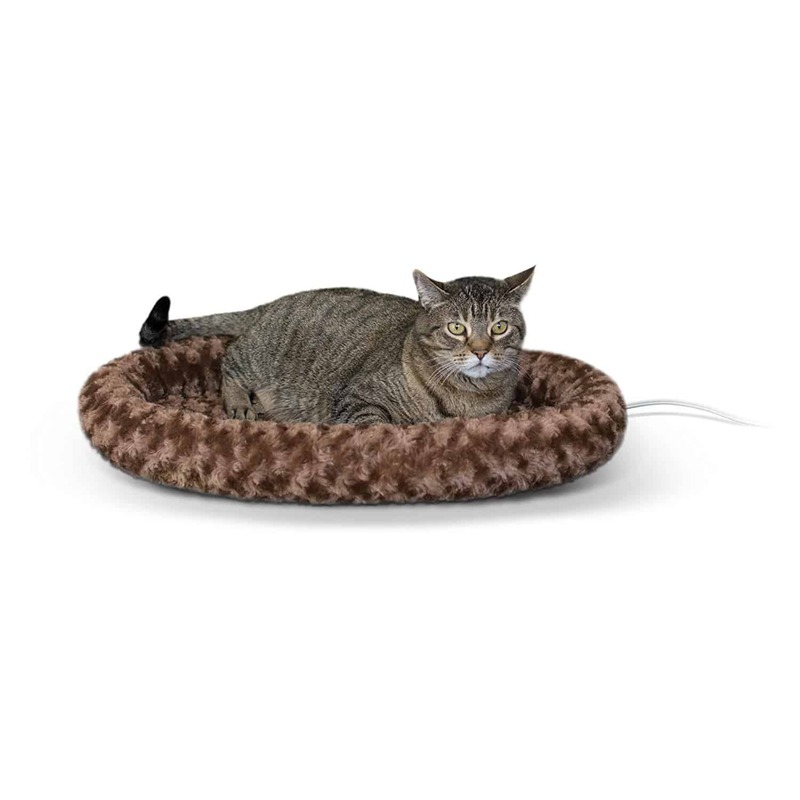 The three models of best cat beds above are sure to meet many cat owner needs. However, certain situations and kitties call for unique features. As such, we wanted to detail a few different bed categories. If you’re looking for a warm kitty bed, then the K & H Thermo-Kitty Fashion Splash Heater Cat Mat is for you. This bad boy will warm up a cold cat every day of the week. If you live in a cold area or find your home is a little chilly, then a heat cat bed should be considered. Many older cats also love warming bed because they help bad joints. Plus, this bed comes in three colors, so it’s sure to match your home’s décor. If you want your furry friend to live in luxury, then the Enchanted Home Pet Artemis Bed is hard to beat. This cat bed was designed to look like a luxurious leather sofa. Your cat will think he’s furball royalty in this thing. Designed to fit every cat, no matter the size, this bed can hold cats up to 25+ pounds. Looking for a stylish cat bed that’s unique and will blend into your home’s decor? Look no further than the Refined Feline Kitty Ball Bed. This stunning model is made of rattan and allows your furry friend to relax in style. With a removable and washable cushion, the 17″ model is easy to clean. Plus, it’s stationed a little bit above the ground, to ensure your furry friend has a nice vantage point. Something cats love. 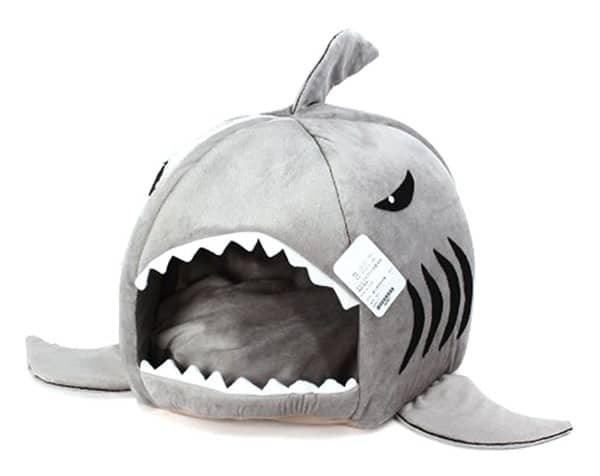 If you’re looking for the cheapest cat bed that your furry friend will use, then check out the Shark Cat Bed. This ridiculous model is super cheap, and many a feline loves it. Just know that the model looks more like a children’s toy than something that belongs in a home with designer finishes. It comes with a removable and washable cushion that’s waterproof. If you have an outdoor cat or your furry friend loves going outside, then the K & H Manufacturing Outdoor Kitty House may be what the doctored ordered. This model offers multiple entrances, waterproofing, and a heated bed. With a removable and washable cover, this model is easy to keep clean. Easy assembly comes standard, along with no tools required for assembling. 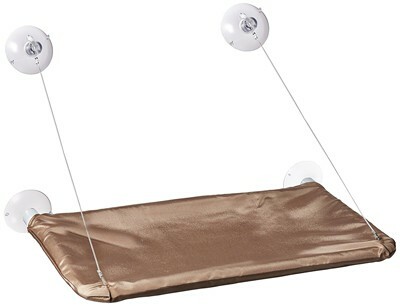 If your home’s styling is modern, then the Hepper Pod Cat Bed may be what you need. A high-quality model designed to allow cats to nap privately and peacefully, the pod makes cleaning simple with a machine-washable liner. The design is crazy stylish and hip. Plus, it comes in a number of different colors, which ensures it’ll match any décor. The bed offers your cat a high vantage point to ensure your furry friend will love it. 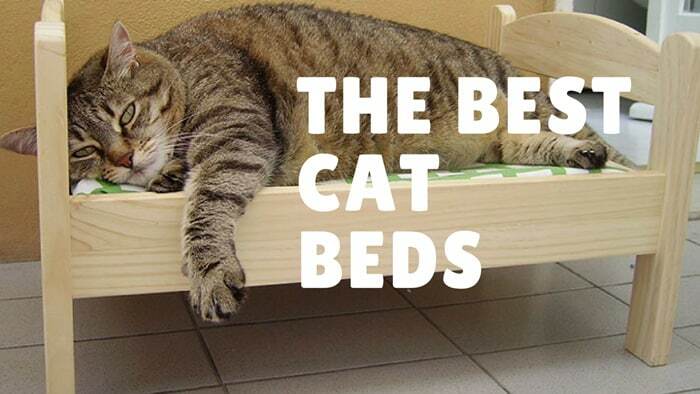 After reviewing many a cat beds, we’re confident the models above will fit your needs. Having a comfortable place for your furry friend to sleep is absolutely essential. Finding the perfect model for your furry friend and you’ll both get a great night sleep!